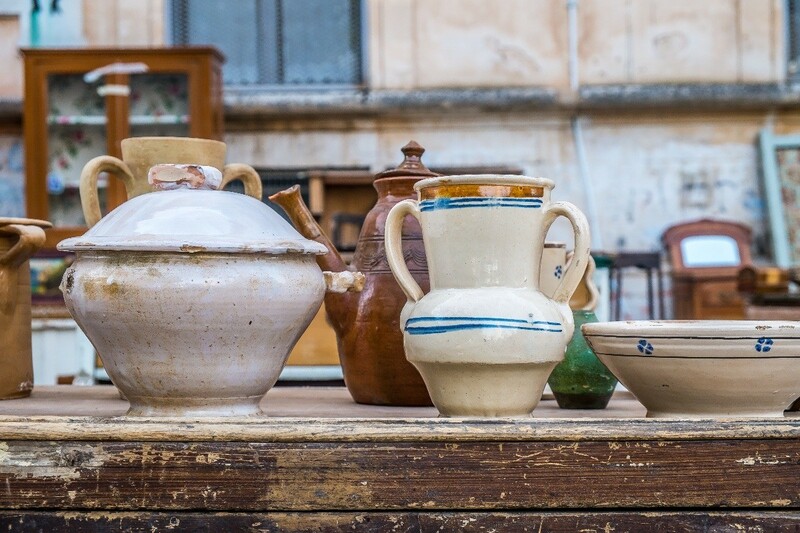 Many discarded or flea market items are actually just waiting for a new life and purpose in your home or garden. This is a guide about trash to treasure. I have to admit, I never throw anything out before giving the item some deep thought on what I could use it for. I have a terrific husband who always asks me if I can use an item before throwing it away! This is my story on what I did with leftover linoleum. After laying linoleum down in our laundry room, I found that we had a good size piece left. Hmmm, I found my mind wandering - I just knew I could use it for something. Then the light bulb came on over my head. I had been wanting a floor cloth for an area in one of my rooms, but after much hunting I found they were very hard to come by and also very expensive. Linoleum is very easy to cut using a good pair of scissors. Any shape and size can be made. I cut mine to a 4 x 6 foot piece. I flipped it over to the white back side and primed it. Once dried, I painted it. Then I did 3 coats of clear varnish, letting each coat dry thoroughly. I was so pleased with the end result! You can use them on any hard surface floor. I keep mine in place by just putting a piece of sticky tac (otherwise known as poster putty) under each corner.This is removable and repositionable. The floor cloths are easily cleaned by just a spray of Windex and paper towels. I have since made many, many more of all sizes and shapes for myself, family, and friends. 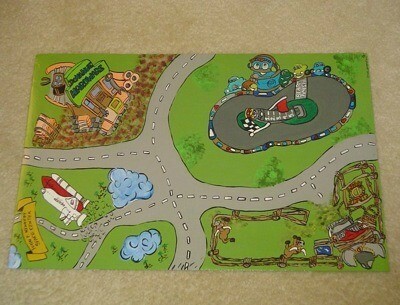 I made a town with roads for my grandson and included match box cars. He loved it! I even got ambitious and made a 12 x 12 foot one for my screened in porch. 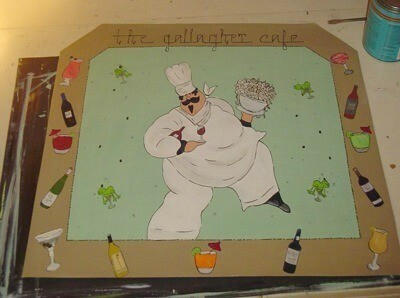 I painted comical insects and dragonflies on that one. Even if one feels they can't paint, after priming, you can trace with pencil, pictures from coloring books, or other sources. 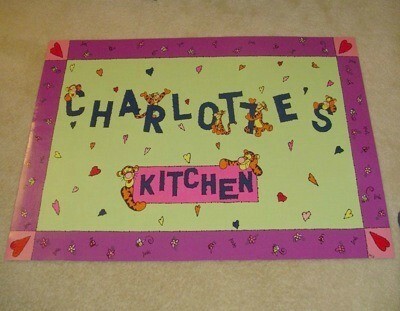 I have even made place mats. I now purchase remnant rolls from home stores. This is a fun project for kids also. Just pre-prime the linoleum for them and let them paint their own pictures. They last for years and make a great keepsake. An amazing job! I love your idea, it's great! I really love your Wine one. I can't wait to give this a try, myself. I am not anywhere as talented as drawing as you are, but I am good at faking it. It's midnight while I am looking at this and I can't wait to get to Home Depot or a flooring store. lol I'll post a picture in a few weeks to let you see how inspired I was. Thanks again, Mary and Frugal Life. I want to say thanks for all the wonderful comments and I hope you all will give this a try. Don't sell yourself short on your talents and you can always paint one with just designs or trace a picture and paint it. Laura, I am so excited that you are going to try this. It is addictive and you will find yourself coming up with another idea while you're still working on one! The possibilities are endless. 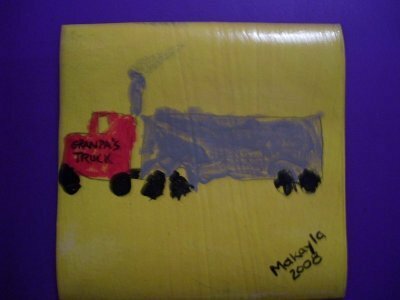 I have included a picture of a 4"x4" one that my granddaughter painted.This one was for us and it's of our truck. She said they are coasters and made 10 of them for family members, each with a different picture she painted. She had a great time doing it and 3 years later, we still have ours. It's a keepsake and it tickles her that we still have it. Please send picture when (notice I didn't say "IF") you make one. I would love to see it. Go get it girl! I've done a lot of crafting, but this one will be new to me. Yours are very nicely done, and so bright and cheerful. Thanks for a great craft idea and easy-to-follow instructions. This is one of the best I have seen since I started. You really do have a talent and must keep it safe and then share it to the world! I am serious! I am going to have to go get some linoleum now! Thanks for the wonderful tip, it is so inspiring, my mind is starting to go over all the ways I can use this amazing tip! I had several items in my yard that I was using as yard art; wear and tear of these items in the weather elements caused rust and corrosion. I changed these items; painted them and they are again a nice addition to my yard art collection. 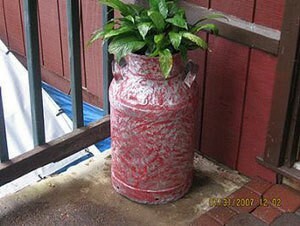 I had an old milk can that the bottom had rusted out; it was painted black a few years ago and had been placed in a flower bed among the day lilies and irises; it had no top on it so I used it as a vase to put fresh flowers in; I painted it and used a spatter technique to finish it; I put a flower pot in it and placed a peace lily in it; I will change the flowers now according to season or holiday. It sits at the entrance of my back door on my backyard deck. I also had an old tea kettle that was bent and had rusted; I painted it and used the spatter technique on it; it sits on an old rusted small pot bellied stove that sits on our backyard deck; I punched holes in the bottom of the tea kettle; this fall it will have pansies in it and will bring lots of color to that area of our deck. The rusted pot bellied stove is inoperable and is used as a garden ornament; I like the rusty color so I will not paint it. You are so talented! Both this and the tea kettle ended up looking so nice! 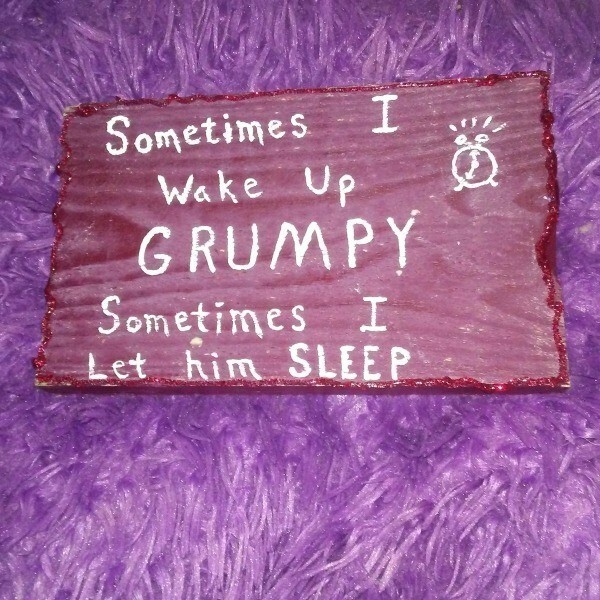 This cute sign was 25 cents at a yard sale I visited. I outlined the sign with glitter glue and put it on our bedroom wall. Besides being cute, it reminds me of a sandbox my dad made for me many years ago. Council Clean Up in our area is fantastic for the thrifty at heart. My best friend and I travel around collecting furniture, books, pots and even the occasional antique. We then take them home make any needed repairs whilst drinking coffee and catching up. Not only do we get a whole lot of new bits and bobs, but we get to spend the day together gossiping! If your lucky you'll pick up a few antiques that have great resale value - only last week we found a teapot worth over $250! A great bonus. 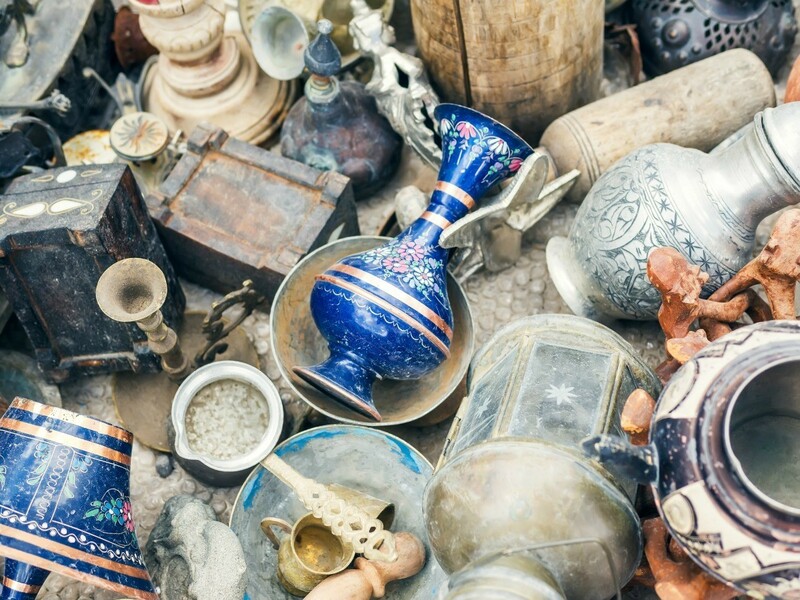 This is a guide about from trash to garden treasure. 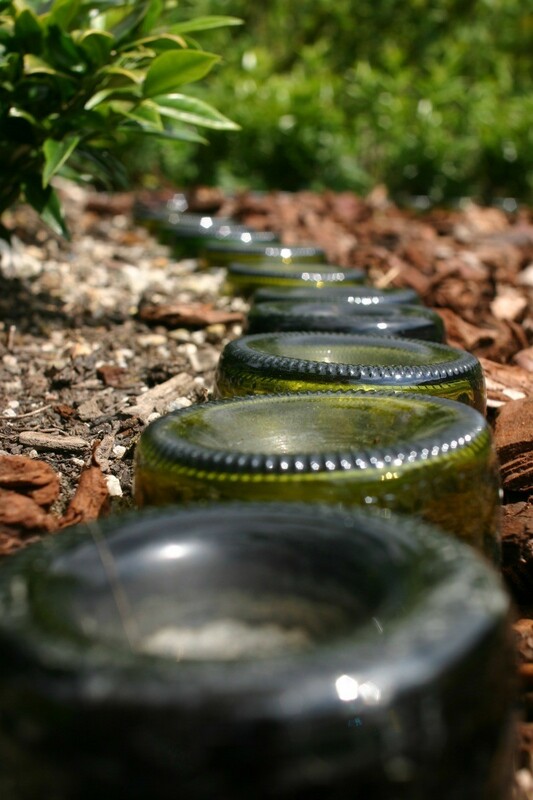 Many items that might be discarded can be recycled into unique garden decorations or planters.